Scientists are always pushing the limits of the technology and looking for more precise products and equipment to enable the next technology. Advances in nanotechnology is what enables this progress. Nanoparticles are particles that have the dimensions of no less than 1 nanometer and no greater than 1000nanometers (1 micron). 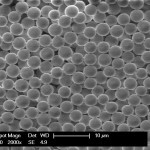 Nanospheres are specialized highly spherical nanoparticles. 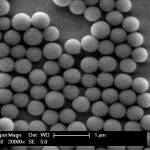 In an effort to provide our customers in the nanotechnology industry with specialty nanomaterials, Cospheric LLC has added a selection of highly precise and spherical monodisperse silica nanospheres to their broad product line and created CosphericNano – a website dedicated exclusively to nanospheres and nanoparticles. Silica nanoparticles (nanospheres) and silica microspheres are now available in distributions of less than 10% CV in the sizes of 0.25 micron, 0.5 micron, 0.62 micron, 1 micron, 4 micron and 8 micron. Each product is extensively characterized under SEM (scanning electron microscope) to ensure perfect sphericity of each nanosphere and tight particle size specifications. Dry precise monodisperse silica nanospheres are frequently used for biotechnology applications, sintering, microfluidics, electronics, optical coatings, spacers and other high tech applications.